Cornish Pirates boss Ian Davies says news that work on the club's new stadium could start soon has put more pressure on the side. Central government decided not to call in plans for the Stadium for Cornwall over the weekend. 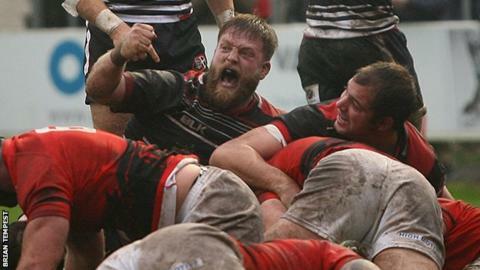 The news came before the Pirates beat London Welsh 28-21 in their first game in the British and Irish Cup. "The news on the stadium is fantastic and I'm sure it gives the boys a lift," he told BBC Radio Cornwall. "But it adds a bit more pressure as well because you've worked so hard to get the stadium, you have to make sure that you're playing Championship rugby in it." The Pirates are currently bottom of the Championship and have only won two league games all season. "We know this is a great win, but we've got Bedford and London Welsh in two weeks time in the league and those are bigger games for us at the moment," continued Davies. "We knew we had to start the cup off with a win. It's a competition we take really seriously. We're disappointed they got a bonus point, but we'll take the win. "If we get everything right, we're a tough team to beat."